Send out graduation announcements several weeks before the event - they're a great way to share the news, and they give people a heads-up that a graduation party invitation is on the way. If you'd like, you can also include more information - like the type of degree your grad is earning, where he or she is headed next, and a quick list of honors earned. Typically, this kind of info looks best on the back of the announcement, mixed in with a collage or above, below or beside a large photo of the graduate. Printed frames around photos offer a more classic look, but using a full-width photo and embedding text is dramatic and modern. Your best bet: Choose a design that matches your graduate's personality, whether it's whimsical and fun or serious and focused (or something in between). Graduation invitations serve two purposes - first, they let everyone know how to share in the celebration, and second, they're a precious keepsake for people who love your grad. Send invitations at least 2 weeks before the big day so your guests will have time to prepare, and pack them with all the information they need to be in the right place at the right time. You can enhance your invitation with photos of the graduate and information on where he or she is headed next, or you can keep it simple. Pick something that suits your grad's personality, whether it's rustic-chic, vintage classic or simple and fun. Mixbook Tip: Don't forget to pick up graduation thank you cards your grad can sign to express his or her gratitude. 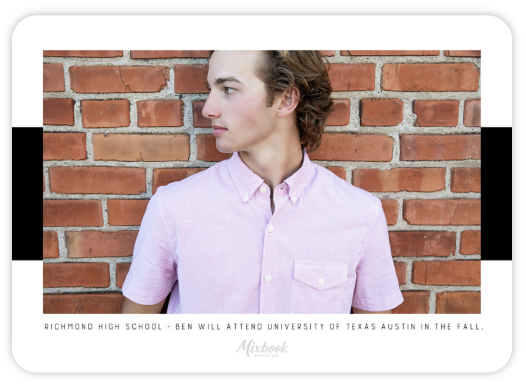 Let your creativity run wild or use a Mixbook template to put together this year's most memorable graduation announcements and invitations - it's all up to you. 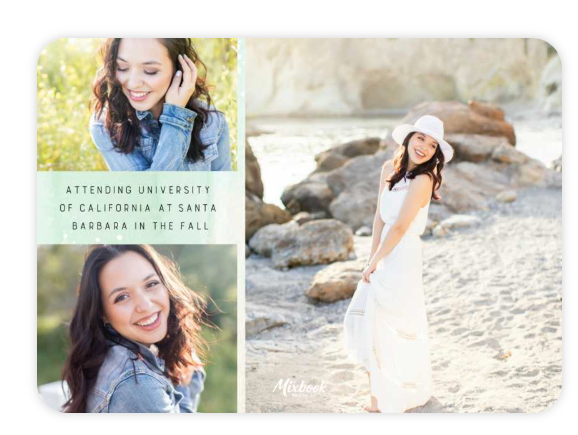 When you're done, share a photo of your graduation announcements and invitations on social media and tag us (@Mixbook) or use the hashtag #MixbookMoments - we can't wait to see your creativity in action! For the latest Mixbook deals, follow us on Instagram, Twitter and Facebook.